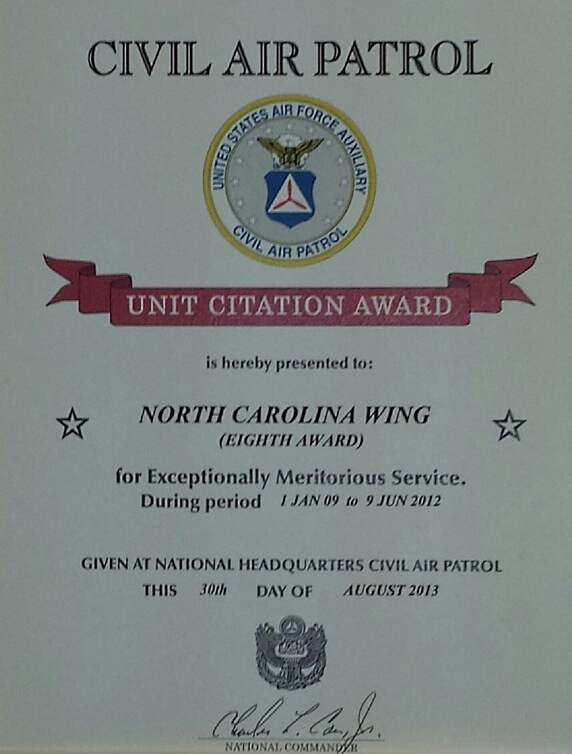 9/17/2013–Burlington, NC–North Carolina Wing has been awarded the Civil Air Patrol Unit Citation (8th award) by National Headquarters for outstanding performance during the period of 1 January 2009 through 9 June 2012. Under the leadership of then Wing Commander Col Roy Douglass, North Carolina Wing was a leader in Operations, Safety, Aerospace Education and Cadet Programs. NC Wing received the Paul W Turner National Safety Award in 2009 and 2011, and the MER Paul W Turner Award in 2009, 2010, 2011 and 2012. The 2011 Summer Encampment was mishap free. In Cadet Programs NC Wing was represented at the National Cadet Competition in 2009 and 2011 by the Apex Cadet Squadron, where they placed 2nd in both competitions. Six Spaatz Awards were earned by NC Wing cadets between January 2009 and June 2012. 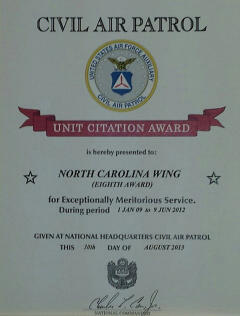 NC received the 2011 Cadet Programs mission award for MER. The 2010 National Cadet of the Year was from NC. NC also hosted IACE cadets in 2010 and 2011. The NC Wing Aerospace Education program was recognized with the Mission Award for AE in 2010, 2011 and 2012. In Operations and Emergency Services, NC wing members led the 2010 Middle East Region SAR College. The Ranger Program was stood up and NC sponsored the Combat Controller Orientation Course at Ft Bragg. NC Wing members deployed to support Deepwater Horizon in 2010 and provided air and ground resource support including the first ever deployment of "Points of Distribution" during Hurricane Irene in 2011. Then Legislative Squadron Commander Lt Col Paul Meade was instrumental in work with the NC Legislature to ensure continued funding and support for CAP and the CAP Division within the Department of Crime Control and Public Safety. Additionally NC Wing had 73% of its representatives sign on as co-sponsors for the Congressional Gold Medal for CAP World War II founding members during the 112th Congress. Members of NC Wing participated at the National level in the development of Professional Development training material in the new CAP Officers Basic Course which replaced the older EC-13 course. Other members participated in working groups in the areas of Public Affairs, Information Technology and Operations. The significant achievements and accomplishments of North Carolina Wing demonstrate the members' pride, professionalism, team work and deep commitment to CAP's missions and reflects great credit on the North Carolina Wing, Middle East Region and Civil Air Patrol.